well, we've reached the end of our fun little journey with the dear vikki otero, first guest blogger on the chi city vegan. a special thank you to vikki for doing this! As we approached the Christkindlmarket on the day before Thanksgiving for our annual gluhwein treat, my partner asked me what I was going to eat at the market. “French fries, fried potatoes, and maybe some potato pancakes if they don’t have egg,” I said. I said it with a poke and wink, but I wasn’t entirely joking. We like to go to festival/fair events, but the vegan pickings are typically slim, and often the potato is all that stands between me and starvation. And that is how I discovered Dönermen, a food truck, caterer, and events booth. They are inspired by, and indeed named after, traditional Turkish/German meat kebabs, or döner. However, from the beginning, they’ve offered a vegan sausage, which they can use in any of their dishes. image from donermen facebook page. Offering vegan food “just takes a few simple tweaks, so why not?” he said, noting that the mere fact that they have vegan options gets them attention. At one beer festival, they were the only vegetarian option, and they had a line stretching through the entire festival that didn’t stop until the end of the festival. As a food truck, Dönermen doesn’t necessarily always have the same audience, and Shawn noted that the vegan options aren’t popular everywhere. 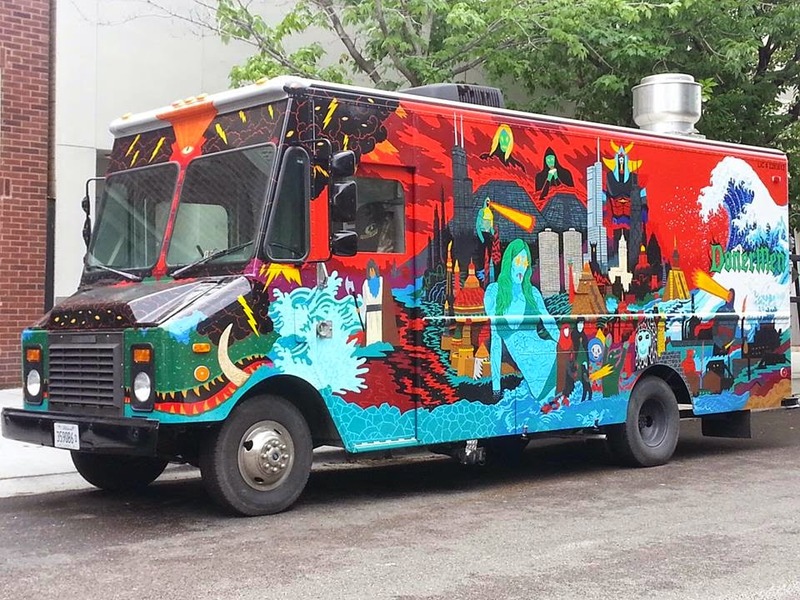 The two locations where the truck most regularly sets up – near the University of Chicago and downtown – have very different reactions to the vegan options. At U Chicago, they “kill it” with the vegan fare, while downtown, the options aren’t as popular. Nevertheless, “these days everything counts,” Shawn said, and is happy to not only make money from the vegan options but also to be able to serve a population that is too easily ignored. At Christkindlmarket, I enjoyed the druidwurst, that is, the vegan version of the currywurst. It was an excellent sausage and I can vouch for the fact that the curry sauce is as delicious as Shawn said. I look forward to visiting the truck sometime, as I’m always delighted to look out for businesses that look out for me. thanks again to vikki!!! who's next??! Every time I think of food truck my mouth start watering. Here in Miami our favorite food truck is Food Truck Invasion the best of food trucks in South Florida. Its yum all the time.... Keep enjoying... Thanks. There's something immediately dignified about this venue for events in New York - it is beautifully designed, tasteful, and understated. Went to this comfy place recently, just the right temperature, good food and great experience. Our website will give viewers a little bit of our story about why we started this business.